The rearseatMOUNT is the essential iPad and tablet headrest mount for anyone on the go. Keep your passengers busy with movies, games and more so that you can focus on the road. With its dynamic design, the rearseatMOUNT works with new iPads and tablets from 8" up to 10". This mount is perfect for people going on long trips or families on vacations. Car rides never have to be without entertainment gain. This mount swivels 360° and secures your iPad or tablet in vertical or landscape mode. It easily attaches to the back of your vehicles headrest. The adjustable securing system works with almost any headrest. A securing bar stabilizes your iPad or tablet in even the shakiest of vehicles. High strength construction provides superior protection to keep your iPad or tablet safe. 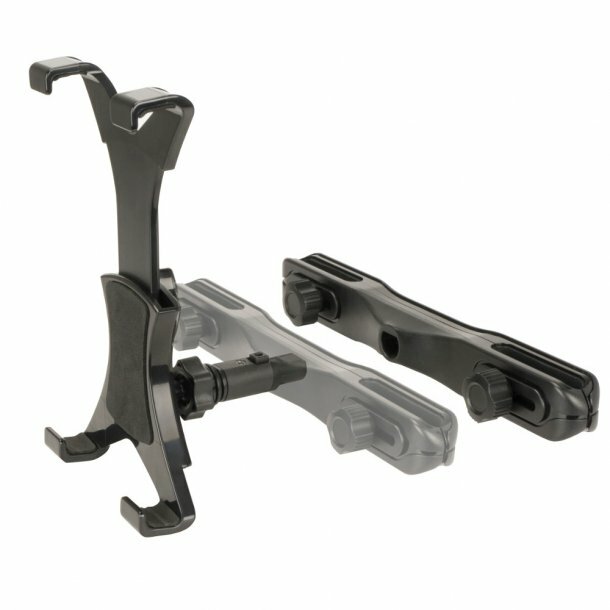 This dynamic mount latches safely around an newiPad or tablet so that even bumpy terrains or sharp turns won't shake your device loose.